When the team attacks (considering Lahm-Boateng-Badstuber is the defensive line) the formation is more like 2-3-5, with only the CB's remaining at the back. When the teams defends the formation turns into a classic 4-2-3-1, and we have seen this against Schalke. Lahm drops back and so does Alaba/Bernat. The team never plays the way they show it on TV. And the proper proof for that is that they showed Muller playing as right midfielder, whereas anyone that saw the game knows that he was always in the middle(manner of speaking, we all now Muller doesn't leave one patch of grass untouched, but still, the middle area was were he ran the show). I have to say that I'm curious about the way the team will move if Benatia, Boateng and Badstuber will play at the same time. Hello friends,when the starting 11 against Sttutgart will be made public? I hope every key player as well as Alonzo and Benatia will be in form and ready for the match. Failure is not an option, we want to win the Bundesliga title. Also winning this match will boost the team's moral and give us more confident to secure 3 points against City. Usually a few hours before the match. Der Maschinist wrote: Hello friends,when the starting 11 against Sttutgart will be made public? I hope every key player as well as Alonzo and Benatia will be in form and ready for the match. Failure is not an option, we want to win the Bundesliga title. Also winning this match will boost the team's moral and give us more confident to secure 3 points against City. They always release official line ups an hour before the match. I think Mueller is good enough to start regularly, but not good enough on the left wing to oust Ribery - well, not just yet anyway. If Gaudino gets another appearance, that makes Hojbjerg's concerns understandable. Alaba-Rode perhaps then Bernat as LB since we've seen that more often so far than Lahm in midfield. Would it not be more likely to see Badstuber at left back and Boateng at right back. Both have played many games in those positions, but rarely, if ever, with the positions reversed. Ribery had a long lay off, he has no match practice...it'd probably be better to use him as a sub for a few games so he gets into a rhythm. Bayern isn't in a good form so best to start with players that are in-form. (Ribery as sub because he hasn't played for a while). I think Dante will play. He wasn't on international duty, is fully fit. JJJ wrote: I think Dante will play. He wasn't on international duty, is fully fit. Neither were Benatia and Badstuber though. Benatia won't play, Guardiola just said at the PC that he isnt fit yet.. Alonso is doubtfull aswell.. It's about time to see something again from Bayern. These international breaks are sometimes really annoying. Forthcoming weeks will offer us a lot of fun. We are going to be seeing this fugly logo for our kits for 3 matches. 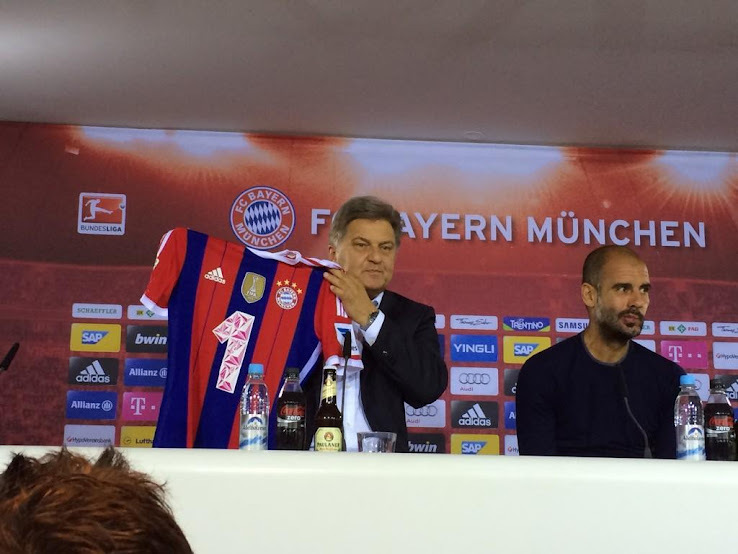 Pep's face says it all.